“Is this all there is in life?” Even at age fifteen I felt unsatisfied with life. Though I had a loving family and I enjoyed school and hanging out with my friends, I remember thinking this to myself. I felt that something was missing—that I was incomplete. One day an old high school friend asked me if I knew that Jesus Christ came so that we could have a more abundant life and that God’s Word, the Bible, had the keys to attain that kind of life. These were all foreign concepts to me. It had never occurred to me that what I had been longing for could be the wholeness that only God could give. I hadn’t seen this person in about a year, and something had definitely changed in his life. He invited me to come and see for myself. I began to regularly attend a Way Ministry fellowship and took the ministry’s Foundational Class. I learned that there is a spiritual component in life, without which no man can be complete. I believed the Word of Truth and was filled to overflowing with the power of the holy spirit. That void in my life was filled. 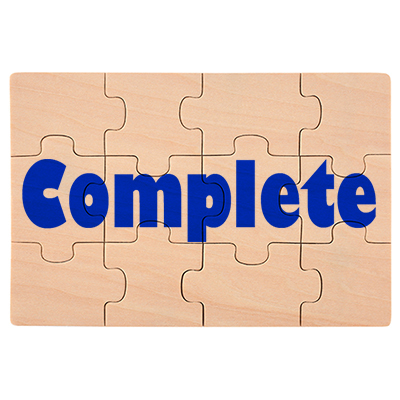 I learned that my completeness in life was in what Jesus Christ accomplished for me. Every person needs a full spiritual life in order to have a full, complete, and satisfying life. My satisfaction in life has continued to grow as I have learned how to manifest more of my completeness in Christ. When a baby is born, it has the complete package needed to grow into an adult. But it takes time and learning to grow to full maturity as a human being. Likewise, when we are born again of God’s spirit, we have all of the completeness of Christ within. But there is a lifetime of discovering and manifesting all of the treasures of our completeness. Do you ever feel as if something is missing in your life? What does God’s Word say about such feelings or thoughts? We will see from the Word that we are complete in Christ, for we are what the Word of God says we are, and we have what the Word of God says we have. Next, we will go to God’s Word to see some ways that we can manifest our completeness in Christ right now. Lastly, we will see that we’ll fully appreciate our completeness in Christ when we experience what the Word says we will be. When we are born again, the Word tells us that we are completely and absolutely complete in Christ. In Christ dwells all the fullness of the head God. Jesus Christ is the first person noted in God’s Word to have without measure all that God could make available at that time. Today we have the fullness of God in Christ in us! What if you purchased a brand-new, big-screen television, and after you set it all up, you realized the remote control that is supposed to come with the TV is missing. What would you do? Would you say, “Oh, I’ll just get along without it; I’m thankful for the TV. It will be good exercise to get up to change the channels, and the TV is almost complete since the remote control is only worth a few dollars”? I know that is not what I would say. I would demand 100 percent of what I paid for. Jesus Christ paid for our entire completeness so that we can have all parts or elements, lacking nothing; being full, whole, and entire. We do not need to settle for anything less than 100 percent of what he paid for. Christ is not lacking or missing anything, and since we are complete in him, neither are we! Another use of this word plēroō in Ephesians 1 shows that we are filled to the brim by what Christ accomplished for us. Which is his body, the fulness of him that filleth [plēroō] all in all. God put all things under Jesus Christ’s feet and made him the head of the Church, the Body of Christ. If Christ is the head and we are part of that Body of Christ with Christ in us, then that puts Satan right under our feet. Satan has absolutely no rights over us. We can extinguish all of the adversary’s fiery darts because we have more power than he has. Christ Jesus, our head, fills all the members of his Body with all that God gives in the new birth, which is Christ in you, the hope of glory…. This is an excerpt from the March/April 2008 issue of The Way Magazine.